A new short, ‘Kie Willis takes on Madinat Jumeriah’, directed by Gerry Blaksley, a 32-year-old Oklahoma native and cinematographer, has just been released by XDUBAI – a Dubai based company specialising in action sports and activities around the region. 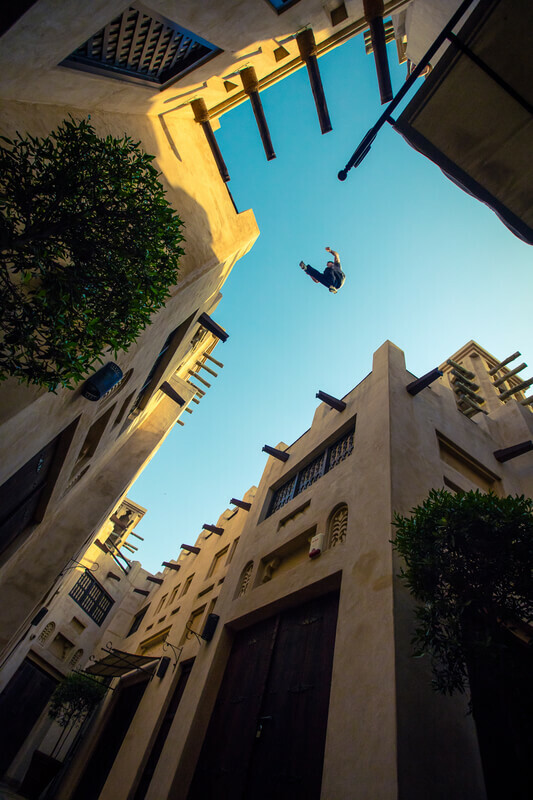 In the film, London-based Parkour star Kie Willis — one of the best free runners in the world — jumps, twists and hurls his body around the castle-like structures of Madinat Jumeirah, a luxury complex consisting of hotels, restaurants, bars and lush gardens. A DJI Inspire 1 drone hovers still over Kie’s sweat drenched back in the final shots – his body ticking to the deadly rhythms of a silent Dubai heat. A sail shaped building comes into the lofty steady frame. It’s the world famous Burj al-Arab hotel. Kie’s body, still moving below, gets smaller and smaller as the drone refocuses its attention to take in the vista. The composition is magnificent. Make no mistake: the film is a showcase for XDUBAI’s ‘be the action’ ethos. Mostly though, it’s about Gerry’s personal quest to push the limits of filmmaking in the region with his use of drones. For Gerry, who started making short unedited films when he was just 15, it’s another upward step in his ongoing quest to be the complete aerial drone filmmaker. Ever curious, Gerry soon found himself tinkering with his Phantom and making modifications. But it wasn’t until the Phantom 2 came out — “with everything I needed built in” — that he felt ready to approach aerial filmmaking in a completely new and invigorating way. A full-time cinematographer with Dubai Film, as well as a content creator for XDUBAI, Gerry waxes lyrical about his growing arsenal of DJI gadgets. For the Kie Willis parkour shoot, Gerry and his crew opted for his Inspire 1 Pro set up. “There was a lot of climbing around rooftops, and its compact size carried a large advantage over the S900 or S1000,” he says, reflecting on shoot logistics. As you’d expect, filming took place in the most blistering heat. Surprisingly, the only element to succumb to it was not mechanical but human; just an extremely fatigued operator - possibly the most important member of Gerry’s film crew. “One of the challenges when I first started was that I had to fly by myself, which eventually became limiting for camera movements,” he offers. For the ground shots — about 80% of the shoot — the crew used DJI’s Ronin camera gimbal with an ARRI Alexa Mini camera, a combination he describes as “being very manageable” on Madinat Jumeirah’s high-low terrain. 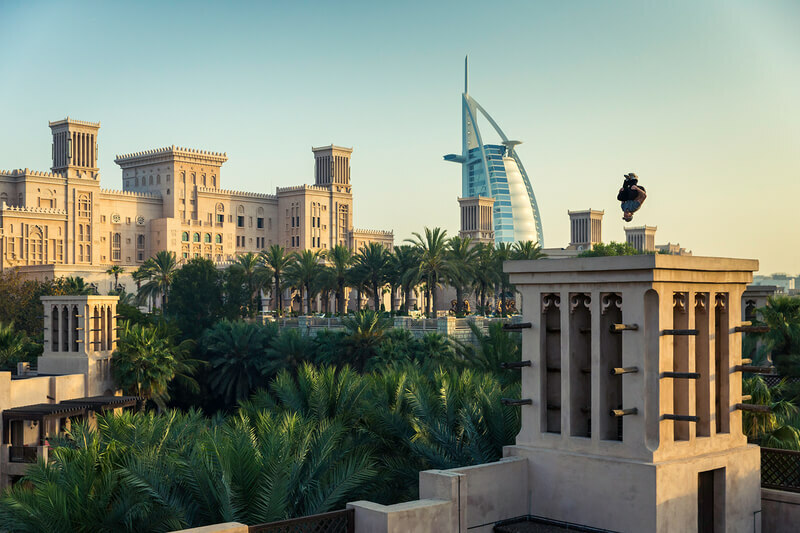 Watching the film, it’s obvious Gerry and his team achieved what they set out to do: showcase the sweaty urban beauty of professional parkour alongside the more refined, dreamy exteriors of the Madinat Jumeirah Resort. “No matter how many hours I have been in the air, I am always learning,” Gerry concludes.